516 pages | 75 B/W Illus. 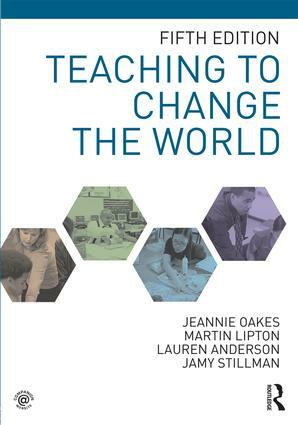 Teaching to Change the World is an up-to-the-moment, engaging, social justice-oriented introduction to education and teaching, and the challenges and opportunities they present. Both foundational and practical, the chapters are organized around conventional topics but in a way that consistently integrates a coherent story that explains why schools are as they are. Taking the position that a hopeful, democratic future depends on ensuring that all students learn, the text pays particular attention to inequalities associated with race, social class, language, gender, and other social categories and explores teachers’ role in addressing them. This thoroughly revised fifth edition remains a vital introduction to the profession for a new generation of teachers who seek to become purposeful, knowledgeable practitioners in our ever-changing educational landscape—for those teachers who see the potential for education to change the world. • Fully updated Chapter 1, "The U.S. Schooling Dilemma," reflects our current state of education after the 2016 U.S. presidential election. • First-person observations from teachers, including first-year teachers, continue to offer vivid, authentic pictures of what teaching to change the world means and involves. • Additional coverage of the ongoing effects of Common Core highlights the heated public discourse around teaching and teachers, and charter schools. • Attention to diversity and inclusion is treated as integral to all chapters, woven throughout rather than tacked on as separate units. • "Digging Deeper" resources on the new companion website include concrete resources that current and future teachers can use in their classrooms. • "Tools for Critique" provides instructors and students questions, prompts, and activities aimed at encouraging classroom discussion and particularly engaging those students least familiar with the central tenets of social justice education. Jeannie Oakes is Presidential Professor (Emeritus) in Educational Equity at UCLA's Graduate School of Education and Information Studies and founding director of UCLA's Center X: Where Research and Practice Intersect for Urban School Professionals. Martin Lipton is an education writer and consultant, a communications analyst at UCLA's Institute for Democracy, Education, and Access, and a former public high school teacher. Lauren Anderson is an associate professor of education at Connecticut College and a former upper-elementary teacher. Jamy Stillman is an associate professor of educational equity and cultural diversity at the University of Colorado Boulder and a former bilingual elementary teacher.